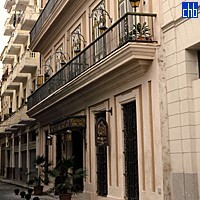 This is a nice hotel in a well kept area of Habana Vieja.<br><br>I actually arrived a day late for my reservation, and the hotel honoured my complete prepaid stay, although I had to wait a couple of hours for a shift change in the management to okay my lateness. Clean, well appointed room, with breakfast at the corner restaurant. Standard amount of hustle and bustle in and around the hotel. 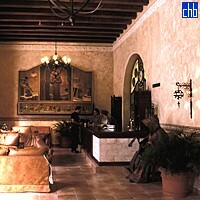 We’ll come right out and say it (again): there are no windows in the 18 standard rooms at the Hotel Los Frailes. Before you shriek with horror, please believe us when we say that the rooms are really attractive and we promise that you hardly notice the absence of fenestration. The thinking behind the hotel’s design is that it should be somewhat reminiscent of a monastery - and monastic cells don’t always have windows. But we think any monk or nun occupying one of Los Frailes standard rooms would be seriously tempted to renounce their vows of simplicity and chastity too: the beds are inviting, the furnishings attractive and the bathrooms are sinfully luxurious. 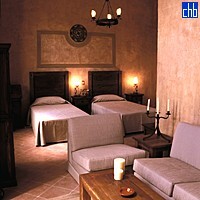 All of the standard rooms are twin bedded. The 4 Junior Suites at Los Frailes are very civilised indeed with high ceilings, attractive faux Colonial furnishings including huge wooden chests, generous bathroom spaces and inviting seating areas preceding the main bedroom area with tall French doors crowned by traditional stained glass fanlights opening onto their own balconies.